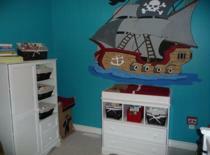 Jolly Pirate Nursery Decoration Theme Ideas, Decor and Bedding to Create Fun on the High Seas for Your Little Matey! Pirates, treasure and fun on the high seas! That's what this nursery decoration page is all about! You'll also find a world of nursery decorating ideas in the wide range of pirate nursery decor available on the market. From swashbuckling chandeliers to treasure map rugs, you'll find everything you need to decorate your pirate baby room at our Pirate Nursery Decor Store. 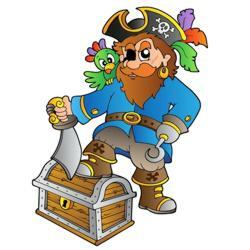 Or visit the pirate theme section at ababy.com. You'll find watery treasures of mix and match pirate theme decor all in one place. Furniture, bedding, lighting, rugs and more. It's your one stop walk the plank theme shop! Click here to go to the ababy.com pirate nursery decoration section. 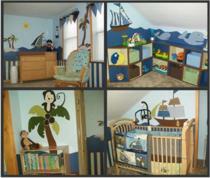 If you are decorating a pirate theme nursery enter it in our baby nursery photos contest here. You could win a great prize and we will add your baby nursery to this page to inspire other moms! Orange, black, white and yellow for showcasing those treasures of the deep. Blue, beige and green for more of a treasure island theme. Blue, yellow and white for an adventure on the high seas. Caramels, creams and browns with aged treasure maps taking center stage. Try red, white and a touch of black for a more modern approach - perfect for incorporating the Jolly Roger. Items from the underwater World such as Mermaids and Tropical Fish. You can easily add these items by painting or adding stickers to the nursery walls, or by incorporating them in parts of your decor such as drawer knobs or ceiling fan pulls. If you decide on a vintage pirate theme, vintage pirate posters in aged golden frames make perfect nursery wall art. You could also add an old vintage trunk done up to look like a treasure chest and some vintage nautical decor like compasses and old life rings. 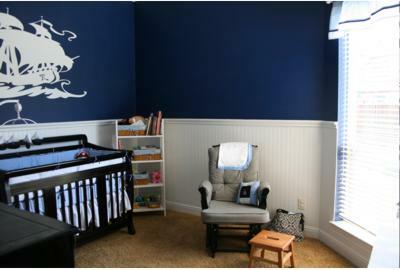 If you want to go for a cartoon type pirate theme, try painting or sticking a big pirate ship on the main nursery wall. Paint whales and mermaids surfing in the waves or palm trees swaying in the warm breeze of the desert island with monkeys and coconuts swinging in them. You could go for more of a high seas adventure. Paint a pirate ship sailing on the sea with a Jolly Roger waving at the mast, a pirate standing on the plank and a parrot wearing a pirate hat in the rigging. Add a treasure chest on the deck. Go to your local liquor store and see if you can buy an old used barrel from them! Or how about a more nautical feel? Add knotted rope to the wall for ships rigging and put a stuffed toy parrot in it. Add a painted wooden ships wheel and anchor on another wall. If you decide to concentrate on the treasure why not paint a beach scene with an open treasure chest spilling its golden secrets? Add a treasure map on another wall. Another idea is to paint your treasure chest at the sea bottom surrounded by a watery world of seaweed, tropical fish and sea stars. Or you could turn the entire nursery decoration into a treasure hunt with clues painted on the walls and added in the nursery decor. Add a few children's storybooks with a pirate theme to your baby's bookshelf. You can talk to him about the pictures in his room and on his bedding as you go through the stories with him at bedtime. A pirate theme nursery can be really fun if you mix it with a Peter Pan and Tinkerbell, Little Mermaid or Under the Sea theme. Paint your favorite characters flying through the sky or frolicking in the waves. Add a plush parrot to keep your little pirate company. Don't forget to add a few pirates in striped shirts and dirty boots around the nursery!